The author moves on to the Sinatic or Old Covenant which is represented by the slave woman Hagar in Galatians 4. The author suggests that the Sinatic Old Covenant was similar to the Abrahamic covenant and makes the astonishing statement, "In both cases, God emphasizes what He will do for His people. He does not ask the Israelites to promise to do anything to earn His blessings; instead, they are to obey as a response to those blessings." In dealing with how Sinai is portrayed in Galatians 4, he goes on to state, "Paul is not claiming that the law given at Sinai was evil or abolished. He is concerned with the Galatians' legalistic misapprehension of the law." First let us deal with the authors contention that the Sinatic Old Covenant was similar to the Abrahamic covenant and that the promises of Old Covenant were not conditioned on obedience. In doing so, it is worth taking the time to fully understand the Old Covenant from Sinai. This is the most prominent covenant in the Old Testament. In fact, when we use the term "Old Testament" we are referring primarily to the Mosaic/Old Covenant. The Greek word "diatheke" can be translated into English as either "covenant" or "testament". The English words "covenant" and "testament" are used almost interchangeably in the KJV, e.g. the KJV in one place translates as "Ark of the Covenant (diatheke)" and at another place translates as "Ark of the Testament (diatheke)". So when we are talking about "Testaments" we're really talking about "Covenants". We have divided our Bibles in reference to the two most prominent Covenants in the scriptures. Contrary to the assertion of the lesson's author, the Sinatic/Old Covenant is in fact a conditional covenant. Let's take a look at the Sinatic/Old Covenant and see if we can distinguish the promise, condition, and sign. So what specifically was the covenant? What were the very words of the covenant? Read the following text and ask yourself what the text says the covenant was. This text clearly states the covenant was specifically the "Ten Commandments". Unfortunately, our English invention of "Ten Commandments" confuses the fact that the Hebrew Old Testament never uses that terminology. Our English phrase masks the fact that the Hebrew term "eser dabar" (full form isaseret haddebarim) is legal language for a covenant document. Therefore, throughout the rest of this commentary I will attempt to use more biblical language by referring to the Old Covenant document as either "The Ten Words" or the Latin form of the phrase "The Decalogue" (Deca = ten & logue = word). Let's look at another text. As you read it ask yourself again what the text says the covenant was. This text also confirms that the words on the stone tablets of the Decalogue (ten words) were the covenant. Let's look at another text for further confirmation. Again we see that the Decalogue was the covenant. I believe we could cite several more texts yet, but let's just look at one last one. Here we get an interesting fact. Unlike the artist renderings we are used to seeing, the tablets of the Decalogue were not just written on one side, but on front and back. This is consistent with what we know of ancient near east covenant documents. These documents were often written on the front and back of tablets with two identical copies produced. One copy would go in the temple of the suzerain while the other copy would go in the temple of the vassal. Many biblical scholars believe that the two tablets of the Decalogue were actually two copies of the same "Ten Words" written front and back. In this case, because God (the suzerain) dwelt in the temple in the midst of His people (the vassals), both copies went into one temple. In addition, we know that the sign of the covenant was usually inscribed in the very center of the covenant document. This is also consistent with the order of the Decalogue. We can highly agree when the author states that "Paul is not claiming that the law given at Sinai was evil.." Indeed, the Law was holy, righteous, and good. We can also agree that the law was not "abolished" in the sense of being destroyed or overthrown, but it was fulfilled in Christ and was only in place for a given time period and a specific purpose. We would disagree with the author's contention that Paul is merely "concerned with the Galatians' legalistic misapprehension of the law." In fact, Paul is concerned that the Galatians are going back to the Old Covenant Law at all (living by the flesh) as opposed to living by the Spirit. In order to make this point we need to step back and revisit ground covered in commentaries for Weeks 5-8. Those who have read all the commentaries for those weeks may wish to skip the following, but it seems prudent to provide a single fairly concise synopsis in order to deal with the author's desire to put New Covenant Christians under the Old Covenant Law. 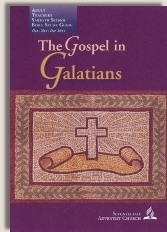 Let's begin by examining the purpose of the law as explained by Paul in Galatians chapter 3. The believers in Galatia had been bewitched by false teachers who were telling them that they were obligated to keep parts of the Old Covenant, including holy days (see Gal. 4:8-11). Paul tells them that everything they have gone through for the faith is in vain if they now turn back to the law instead of continuing in the Spirit. In fact, he calls them foolish for turning back to the law. He now turns to Abraham, who lived under a covenant of faith not works, as an example. So then those who are of faith are blessed with Abraham, the believer. Gentile Christians, like those in Galatia, had something in common with Abraham; they were never under the Old Covenant. They were never required to observe holy days or any other part of the Old Covenant. Paul makes the point that those who are of faith are the true heirs of the Abrahamic promise, not those who are living by law. We are all justified in the same way as Abraham, through faith. We do not receive the blessings of God through the law, but by faith. Paul goes on to give a dire warning to those who want to be under the law. Unless a person is able to keep the entire law perfectly, every bit of it from day one till death, they are cursed and are under the wrath of God. So obviously no one is going to be able to stand righteous before God through law-keeping. In fact, that is the exact antithesis of faith. The law is not of faith. But the Good News, the Gospel, is that Christ redeemed us from the curse of the law and from the wrath of God. Christ took the curse upon Himself and entirely fulfilled the law in His life and death. This made it possible for Gentiles to enter the blessings of Abraham even though they never received circumcision (entry sign of the Abrahamic Covenant) or kept Sabbath (repeatable sign of the Old Covenant). Christ fulfilled both covenants. He fulfilled the promises of both and accepted the curse of the latter. The gentiles were never under the Old Covenant. They entered a New Covenant and received the promise of the Spirit through faith alone. Notice here that the true objects of the promises made to Abraham are Abraham and the coming Messiah. They were not necessarily promises to ethnic Israel per se. The fact that ethnic Israel was given the Old Covenant 430 years after Abraham doesn't invalidate the promise made to Abraham and his seed (singular). The promise was not based on law or works. The law was only a temporary covenant that was added later. It had a beginning 430 years after Abraham and, for those of faith, an ENDING when the Messiah came and fulfilled the promise. So here we finally see the purpose of the law. It wasn't given to invalidate previous promises, but to condemn us in sin and to vividly point out the need for a savior. As stated above, any failure at all puts us under the wrath of the righteous God of the universe. The law points out that no human mediator could ever save us from that wrath. Only God Himself can sovereignly save. The law illustrates like nothing else that we are dead in sin and there is absolutely no way we could ever be declared righteous by our own merit or works. The law proves beyond any shadow of a doubt that salvation must be by grace alone, through faith alone, in Jesus Christ alone. The law drives us to Christ and to His cross. But notice, it was only added UNTIL Christ. When we are in Christ we are no longer under the law. The Greek word "paidagogos", which is translated as "tutor", means "child-conductor". It originally referred to the slave who conducted the boys from home to school. That was the purpose of the law. The law shows our need for a savior, drives us to Christ, and then ceases to have a function in the life of New Covenant Spirit-filled believers. We are no longer under a tutor! Let me say that again, WE ARE NO LONGER UNDER A TUTOR! The Bible could not be clearer on this. If we are of faith we no longer need the tutor. The law is not of faith and returning to the law is antithetical to life in the Spirit. It is a bewitchment! It is a foolish thing to return to the law. This passage is also quite powerful proof that the law was only in effect for believers from the exodus to Christ (see verses 17 – 19). This passage should forever put to rest the idea that the law preexisted the exodus or that it continues to be a tutor or teacher for those who are living life in the Spirit. The Sinatic/Old Covenant was a conditional covenant. God promised the Israelites they would be His special people and stay in the Land, if they were obedient (the condition). The sign of the Old Covenant was the Sabbath. The Old Covenant document was the Decalogue. The Law was a temporary covenant added 430 years after Abraham, but didn't invalidate the promises of the Abrahamic covenant. The Law was a tutor to drive people to Christ, but now that Jesus has come we are no longer under a tutor.